I received One Tiny Lie from the publisher in exchange for a fair and honest review. I wasn’t sure what to expect when I picked up One Tiny Lie. I loved Livie and the rest of the characters that we got to know in Ten Tiny Breaths. She was the stable one. There was no way that her story could be as intense as Kacey’s right? Well yes and no. On the surface Livie had it all together. She was the strong one, the smart one, the one who had known who she was and what she wanted since she was a very little girl. Kacey’s story was about recovery and the steps it took to get there. Livie’s was more a story of self revelation Now that I’ve read them both I honestly can’t say which one I liked more.The story takes place a couple of years after Ten Tiny Breaths ends – actually a few months before the Epilogue. The timing is perfect because Kacey has gotten through most of the hard stuff and can concentrate on Livie. I love her approach to help her little sister ‘live’ and embrace college life. Yeah, it’s unorthodox and slightly bent, but that’s Kacey and it gives her just the push she needs to come out of her shell. It’s that push that throws her into the arms (almost literally) of Ashton and from that moment on nothing is the same, for either one of them.If you read One Tiny Lie, it should come as no surprise that one of my favorite characters in that book was Dr. Stayner. He is one of those characters that I wish I could track down and meet. He is now my fictional hero. As a practitioner he is more than likely a law suit (or straight jacket) waiting to happen. Yet as unorthodox as he is, he is not only respected, he gets results and as much as Kacey and now Livie want to strangle him, they are also totally in love with him at the same time. I was thrilled that he played such a big role in this book.Stayner was just one example of the strong supporting characters in this series. They all play a huge part in the development of the story and keep things more than interesting. I loved getting to know past characters better and the new characters were just as interesting. The characters are smart, funny and there was so much more to them than what there seemed on the surface. They did things that made me laugh, get mad and even shed a few tears. Yes, there was more than one heart breaking moment in One Tiny Lie. Some were inevitable but there were a few that I never saw coming. 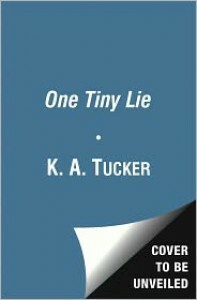 One thing that you have to keep in mind while reading One Tiny Lie is that no one is perfect and not everything is as it seems. As mature as Livie seemed, she still had a lot of growing up to do and as irresponsible as Ashton seemed no one really knew him at all. There were adults that I wanted to applaud for being so sincere and kind and others that I wanted to scream at and shake – or worse. When a book is capable of bringing out all those emotions and then some you have to sit up and take notice. I don’t know if there are more books in store for Ten Tiny Breaths, but if there are they are automatically on my TBR list.